A disaster is unfolding in Cape Town. Three years in a row of severe drought have left the second-most populous city in South Africa preparing for heavy water rationing and the equivalent of rolling blackouts for water. “All water must be conserved now, including non-drinking water from boreholes and other sources,” Richard Bosman, the executive director of Safety and Security for Cape Town, wrote in an October letter announcing the city’s plan. Cape Town got to this point following back-to-back-to-back dry years, the worst of which has been this year. The city has a climate similar to Los Angeles and other California cities with a wet winter—for the southern hemisphere, that means June-August—followed by a dry summer. The rains just didn’t materialize this winter for Cape Town. They’re currently dealing with a 12-inch rainfall deficit, a major shortfall for a city that only receives 20 inches of rain per year on average. It’s currently the driest year ever recorded in Cape Town since record keeping began at the airport station in 1977. Last year, the second-driest on record, ended with an 11.5-inch deficit. And then there was 2015, in which 7 inches of rainfall were missing, making it the fourth-driest year in Cape Town’s history. 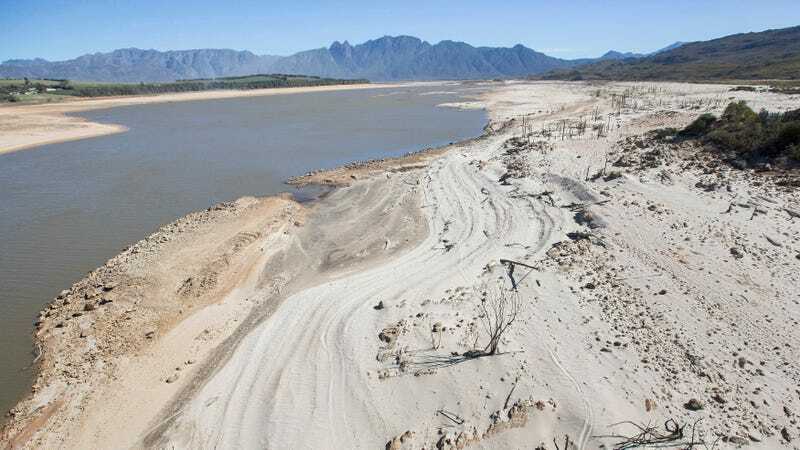 “The Theewaterskloof Reservoir currently stands at just 27.3% of capacity as of the end of October, a far cry from 2015 when it stood at 74.5% of capacity. This is the reservoir clearly shrinking in the above satellite image. And while 27.3% might seem like an already tiny number, city officials take care to note that the last 10% of the dam’s water is difficult to use so the real usable water level is around 17.3% (27.3 – 10). The drought has also taken a toll on other parts of the West Cape as well. Approximately 50,000 agricultural jobs have dried up according to News24. The same report also indicates the dip in wine production could cause $37.5 million in losses across the supply chain. Scientists haven’t specifically attributed the drought to climate change, but it’s certainly in line with climate trends. The South African Weather Service produced a recent report that shows Cape Town and much of the rest of South Africa are expected to dry out as the climate warms. 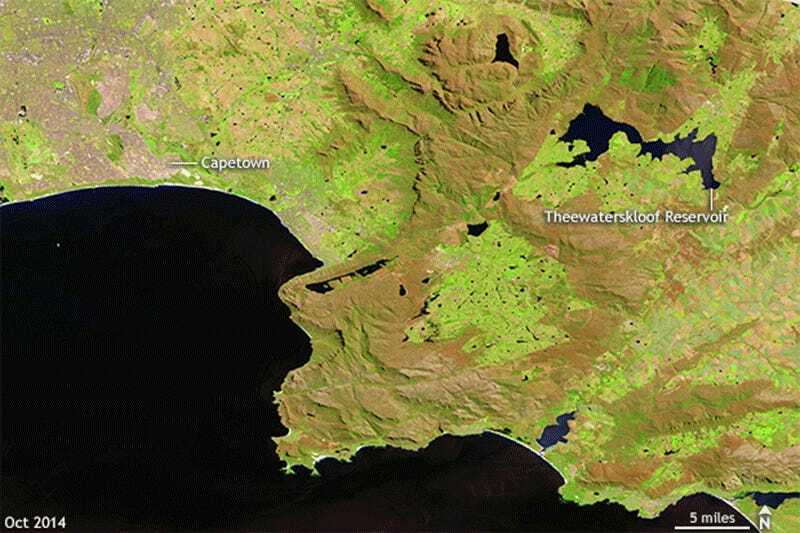 Cape Town could see a 20 percent reduction in rainfall by mid-century and a 25 percent reduction by the latter half of the 21st century if carbon pollution continues on its current trends. Rising temperatures will only raise the risk of drought further, something California dealt with during its recent epic drought. That means regardless of the causes of this drought, it’s a preview of what Cape Town’s likely future is.